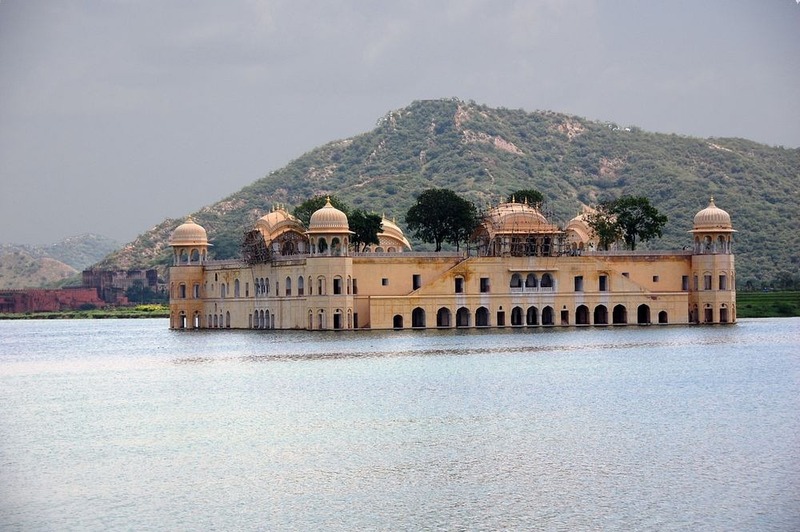 Submerged in the waters of an artificial lake, in the “pink city” of Jaipur, in the state of Rajasthan, India, is the beautiful marbled palace of Jal Mahal, or “Water Palace”. 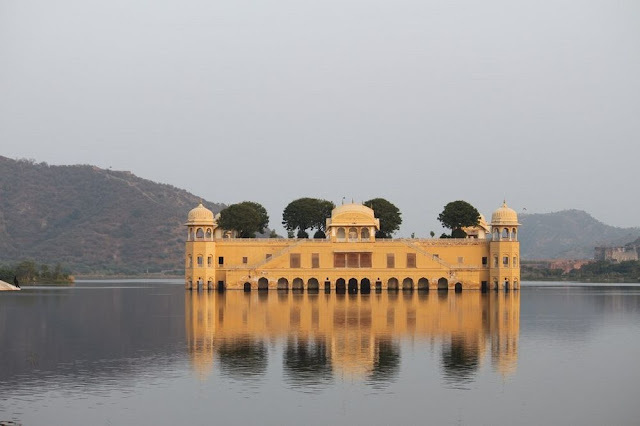 Not much is known about its history, except the fact that it was constructed by Maharaja Madho Singh in the 18th century —the precise date is unknown— as a place for his duck hunting parties. Later, Madho Singh’s son, Madho Singh II, enlarged the palace by adding a courtyard. Then, it fell into disuse and remained terribly neglected for two centuries until its recent renovation in the 2000s. Jal Mahal is a curious structure. It’s not exactly a palace, because there are no habitable rooms to stay. Just a terrace garden where the Maharaja took leisurely walks. The palace is actually five stories tall, but only the top floor stays above water. The lower four floors remain mostly submerged when the lake is full. 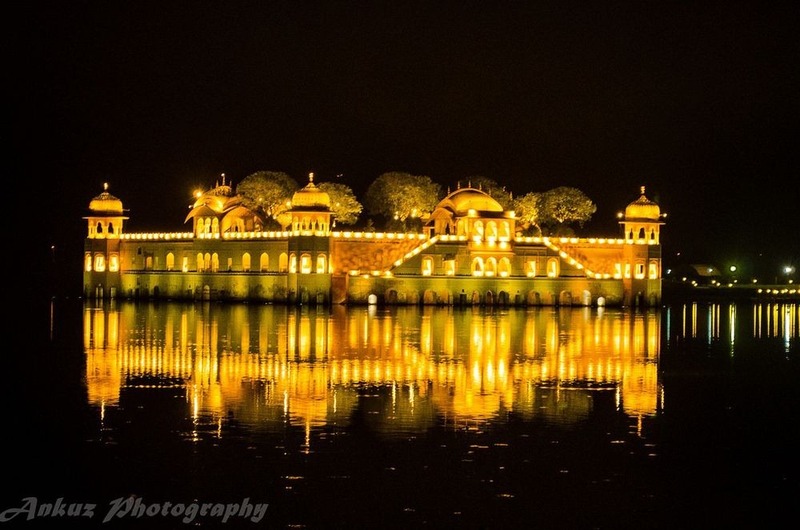 Jal Mahal is a blend of different architectural styles, such as Rajput and Mughal, which is actually very common across Rajasthan. Rajput architecture is mostly inspired by traditional Hindu architecture, while Mughal architecture is heavily influenced by Islamic and Persian styles. You can see bits of both in Jal Mahal. The hallways and grand chambers on the first floor are gracefully decorated with beautiful paintings. On the terrace of the palace, there is a garden with arched passages. At each corner of this palace are semi-octagonal towers with an elegant cupolas. At the center of the terrace is a Bengali-style rectangular pavilion called a Chhatri. The artificial lake, Man Sagar, in the middle of which Jala Mahal stands, was constructed in 1610 by Raja Man Singh, the then ruler of Amer, in response to a famine and acute shortage of water that plagued his state at the end of the previous century. In order to prevent such a reoccurrence, Raja Man Singh ordered a dam to be built across Dharbawati river, along with a reservoir, the Man Sagar Lake, for water storage. For decades, the lake provided the inhabitants of the region with water for drinking and irrigation. It was also home to a large number of bird species. But in the last century, the lake became a dumping ground for raw, untreated sewage and other industrial wastes. The filthy water and the stink kept visitors away from this otherwise splendid monument. 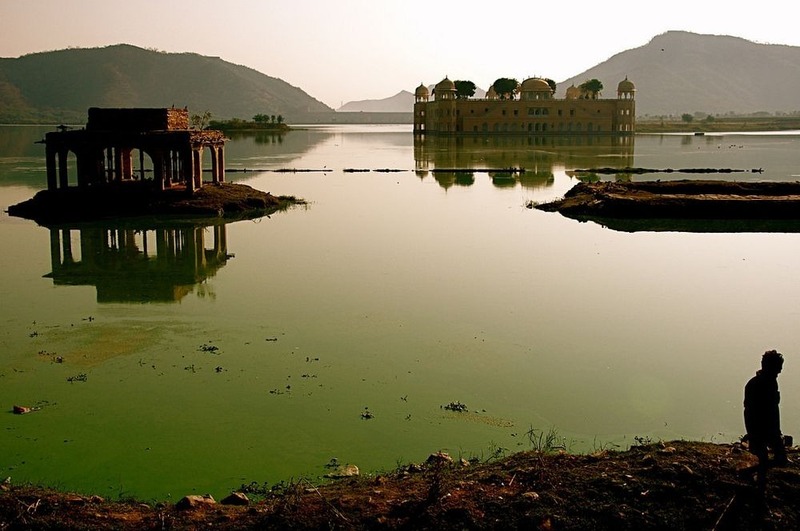 In 2004, a privately owned company took over the whole area of the lake including Jal Mahal with the intention of turning it into a resort and a tourist destination. For the past decade, the company has been busy cleaning the lake and restoring the palace, and the results have been positive. The water quality has improved and the birds have returned. 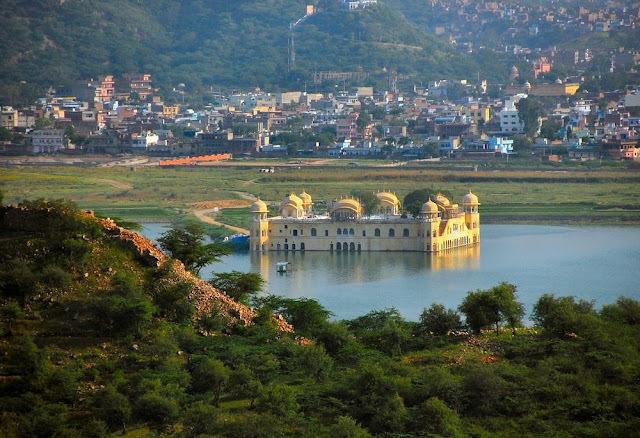 Jal Mahal is still not open to tourists, although you can enjoy the view of the palace by boating in the lake.